Yamato Ogata’s mother Miwa, left, holds a picture of her deceased son during the final game of Daisuke Miura’s pitching career on Sept. 29. （October 19, 2016　By Yuichi Sato / Yomiuri Shimbun Sportswriter） No matter how much he got knocked around, he would still take the next challenge head on — that was the kind of professional baseball player he was. Yokohama DeNA BayStars pitcher Daisuke Miura, 42, made this his final season after last year posting at least one win over 23 consecutive seasons to tie the Nippon Professional Baseball record. Fans refer to him as “Hama no Bancho” (Yokohama’s Leader of the Pack). The driving force behind Bancho’s strong-willing pitching style was a little boy who has struggled with leukemia. The boy was Yamato Ogata, who died in 2007 at the tender age of 7 from acute lymphocytic leukemia. In March of that year, hearing Yamato hoped to one day see him in person, Miura paid a visit to the hospital where the boy was being treated to meet him for the first time. They played catch in the hospital chapel that day. When Yamato was well enough to leave hospital grounds temporarily in May after having gone through anticancer drug therapy, Miura invited him to Yokohama Stadium to let him take a swing with a bat and to give him a tour of the field in a cart used to drive relief pitchers to the mound. Miura was old enough to be the boy’s dad, but thought of him as a “baseball-loving friend.” Miura would often send Yamato game balls after victories, and forward him video messages when the pitcher could not visit the hospital．　However, in September, after having fought the disease for about five years, the boy died. “Yamato, in his little body, knew what he was up against and did the best he could,” said Miura at a memorial service held about a month later. In tears, he made an offering of white Casablanca lilies before Yamato’s portrait and promised that he, too, would do his best. Nine years later, Miura made his final appearance on the mound as a player in a game against the Tokyo Yakult Swallows on Sept. 29. He was knocked around for 10 runs, but didn’t flinch as he stayed on the mound, working into the seventh inning. 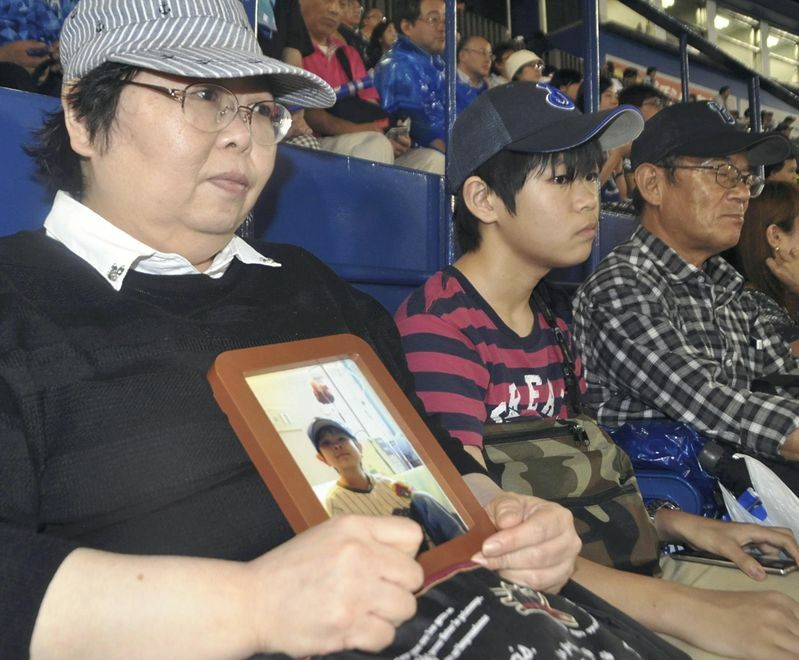 Yamato’s mother Miwa, 49, was on hand to witness Miura’s gallant effort from seats behind home plate with a photo of her son resting on her lap.